01/02/2019 - I've added a version of the EXE-Only download which is identical to the original v1.1 download but compiled with Visual Studio 2015 instead of 2017. This may be an option for those whose virus scanners are reporting a false positive with the original v1.1 download. Note: This is an intermediate difficulty tool, but very usable by a novice - however if you do not know what an Instance ID is, or have not been directed by someone on an id to search for, you should probably not download this. You know you have a bad resource in your game mods, perhaps from a Last Exception, but you have no clue what package file it's in? Look no further, TS4 Package Searcher will do the looking for you. Simply launch the program and type (or paste) in the resource's Instance ID you are looking for. You can type the ID in either hexadecimal (e.g. 0xD279BD3BE12631C7) or as a plain decimal number (15166361285024952775). Select the folder you wish to search in. By default your Mods folder should be located on the first run. If you search another folder (e.g. the game install folder) then that folder will be saved as the new default. Double-click a result to view that file in a new Windows Explorer file view. You can download either a Windows Installer file (MSI) or just the EXE. In either case, you will need an archive program which can handle rar archives, for example WinRAR or 7-Zip. 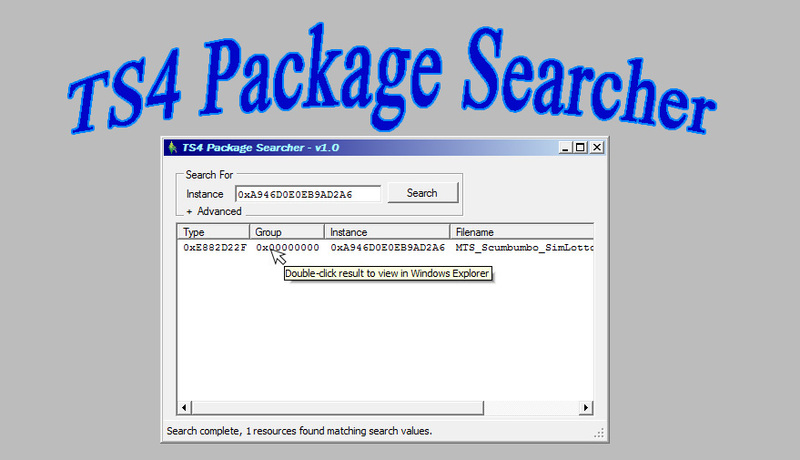 Installer Method - After extracting the installer from the file you've downloaded, you can double-click the TS4 Package Searcher_v1.0 file to launch the installation which will place shortcuts into your start menu for the program as well as web links here and to Turbodriver's lastException Assistant. EXE Only Method - You can place the TS4 Package Searcher.exe file you extracted from the download file into any convenient folder, onto a USB stick or even on your desktop, and double-click it to run the program. You can perform an advanced search by clicking the plus sign to open the advanced search view (this setting will be saved). Once enabled, you can search for all files that contain a resource by the Instance ID, or by Type or Group. If you don't know what these are, stick with the basic search! For instance, to find all STBL resources in all packages, click on the Type box and select 0x220557DA (STBL) from the drop down list. You can also type in the Type ID number manually. Requires Windows 7 or above with .Net 4.5 or greater installed. Likely you already have this version of .Net if you have Windows 7 or higher. Turbodriver, for pushing me to write this utility that I've planned to write for so long and kept putting it off! Download either the MSI Installer, or the EXE-Only version and follow the instructions on the description page to install and use. 3. Download either the MSI Installer, or the EXE-Only version and follow the instructions on the description page to install and use.